Koblenz SP15 Accelerator gives you Green operation. 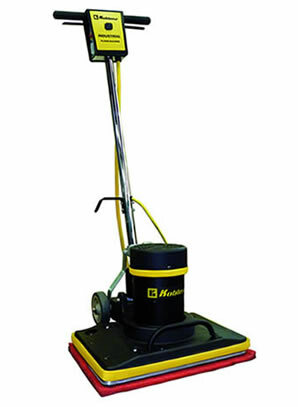 Removes floor finishes without the added cost of of using toxic or hazardous chemicals. Boost you productivity up to 5,000 sq ft/hour. The Koblenz SP15 rectangular design allows you to reach corners that are missed by rounds pads. The Koblenz SP15 comes with a powerful 1.5 HP heavy duty sealed induction motor with 3500 RPM. Works on both wet or dry surfaces. This Koblenz is ideal for scrubbing, screening, and sanding. Cast iron heavy weight chassis for better stripping performance. Powerful 1.5 HP sealed motor. 3500 RPM orbital speed for better and faster results. Cast aluminum rectangular 20" x 14" pad driver plate. Heavy duty chromed handle, 13 gauge steel, 1¼" diameter. 5" non-marking wheels for easy transportation. Safety switch prevents accidental start-up. Non marking full wrap bumper. Eliminates the need of costly chemical strippers and increases your productivity saving thousands of dollars each year. Optional 6 amp pigtailed outlet kit may be used to connect a vacuum. Two year warranty on the motor, and one year limited warranty on parts and workmanship (excludes wear items). Warranty one year on parts and labor two years motor. 138 points will be rewarded to you when you buy this item.